There is nobody who publishes something without reason at Instagram. Private individuals also want people to view and interact with their perfectly framed and edited images. Unfortunately, not everyone likes anything when they come to your site, or comments on one of your posts. At some point, everyone wonders “who’s looking at my Instagram Feed,” but the answer can be frustrating. It is possible to see when people view your posts, but only for certain types of posts. The features are long gone. Android & Ios Apps: Who has viewed my profile? So, you can now see who viewed your Instagram Feed? For your usual Instagram posts, there is nothing you can do to see who is looking at your images unless they interact with you. If your account is public, everyone is free to visit your site whenever they want, unless you have blocked their account. But even with blocked accounts, the user can simply log out and view your profile on the mobile phone or create a new account to view your content. If you are worried about who is viewing your account, the best solution is to set your account to private. This will drastically affect your interaction such as Likes or comments, with other users, and the exchange with you will be more difficult, but it will allow you to put your privacy above any other concerns. 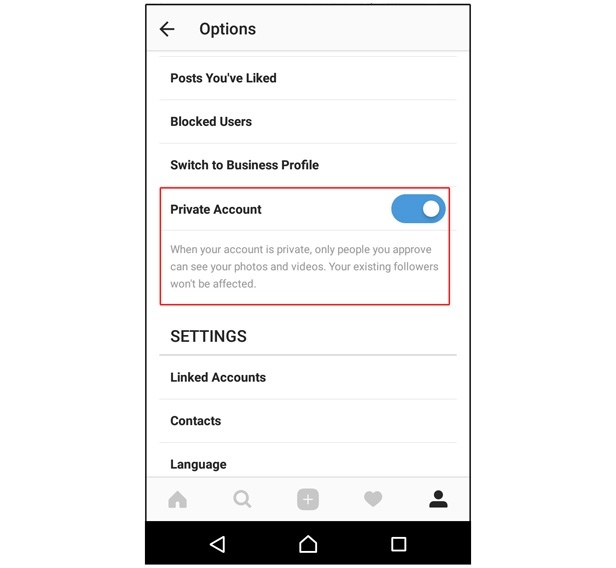 To set your Instagram account to private, tap the profile icon in the bottom menu of the app. Once you are in your profile, select the gear icon at the top right of the screen. The device opens the Instagram Settings menu. Scroll down the Settings menu until you see the Account options. Halfway you will see a button with the title Private account. This feature prevents anyone who is not already following you from viewing your account and requires that you manually approve any new requests from followers. In the summer of 2016, Instagram introduced Stories, a feature that allows users to create snapchat-like videos that are only available for a limited time. The feature is very popular, and fortunately Stories also has the best privacy settings of any features in Instagram. Instagram Stories automatically follow the privacy settings of your account. If your account is private, your stories are private. Stories published on public accounts can be viewed by anyone. However, unlike normal Instagram posts, you can see who is looking at your stories. To see who is viewing your Instagram Story, go to your profile and select your own story. During playback, scroll from bottom to top. A page will appear showing who viewed the videos and images in your Instagram story. Suppose you’re looking through the list of your Instagram stories and you see someone you don’t want to see in your story. Next to each name on the list of those who viewed your story is a small X. If you click on this X, you can prevent this user from seeing your stories, even if he is following you. Blocking someone from your stories will not block them from your main feed – it will only block them from your stories. Any app that claims to be able to show you who is looking at your Instagram account is lying to you. Some apps may be able to recognize who hasn’t followed you in Instagram since your last login, but it’s impossible for an app to track your Instagram Follower. The Instagram API does not provide or share this type of information, making it impossible for an app developer to provide this service. What is an API? An API or programming interface allows two Apps to communicate with each other. APIs control which information applications can access and which they cannot. Just because Instagram can see who is viewing your account does not mean it has authorized its API to share this information with you or any other application. There is nothing that would make us happier than the opportunity to find out who looked at our account that way. At least in theory. But it’s probably better not to know. For most people, this realization would have only one real purpose: to stress themselves unnecessarily. Would it do your heart good to know that your swarm is looking at your side? What if he never looks at your side? Or, conversely, do you want everyone on whose instagram you are hanging around to know when you are there? There are good reasons to keep certain people out of your social media if they cause you inconvenience, but beyond our curiosity there is no good reason to know who is following you more closely. Accept that in a world where we know everything about everyone, we are lucky to have this one secret.